Water droplets keycaps bring softer hand feeling and smoother clicking. The key-stroke travel of chiclet keys is much shorter than normal keys, provides sensitive feedback and best typing experience. Powered by 2 alkaline batteries (1 AAA battery for keyboard ,1 AA battery for mouse, not included), the keyboard will last for up to 15 months, and mouse for up to 24 months. The battery status indicator on the upper right will remind you when battery power is low. Compatible with Windows 2000/ME7/8/10/XP, Vista, Mac, etc. Works great for desktop, laptop, PC, MacBook and other devices. 1. There is no individual CPI button and you can adjust the CPI by press left/right button for 3 seconds. 2. 12 multimedia keys（F1-F12) are not available in Mac System. 3. Mute means lowering the volume of the button to the largest extent rather than eliminating the sound totally. 4. To ensure a better signal transmission, please confirm that there are no obstacles or electromagnetic wave around the mouse. 5. Only AAA alkaline dry battery and AA alkaline dry battery are available for the keyboard and mouse. Please take out the battery when not use for a long time to avoid corrosion. 2 IN 1 RECEIVER WITH 2.4G TECHNOLOGY: A tiny USB Nano receiver (stored in the back of the mouse) connects both the keyboard and mouse with just one USB port, so you can have more ports for your other devices; Plug and play! Deliver the reliability and speed of 2.4 GHz wireless connection. The effective transmission is up to 33ft. 104 CHICLET KEYS LAYOUT: Special-designed water droplets keycaps match well with finger shape to deliver comfortable and smooth typing, providing all-day comfort for each finger. 104-Key Chiclet Keyboard makes every keycap independent to each other as if they are floating on the keyboard surface. Give you a responsive and tactile feedback. 12 MULTIMEDIA SHORTCUTS: Want to turn play your favorite movie, skip a boring song or jump to Amazon? It's all at your fingertips with 12 multimedia keys that give you instant access to your favorite multimedia options, music, internet, e-mail, volume, and more. (NOTES: It's not available in mac system). Ideal for productive work and PC gaming. Also, this keyboard works perfect with Windows, Vista, Mac, PS4, ipad, Xbox etc. INTELLIGENT POWER SAVING: Tired of short battery life? 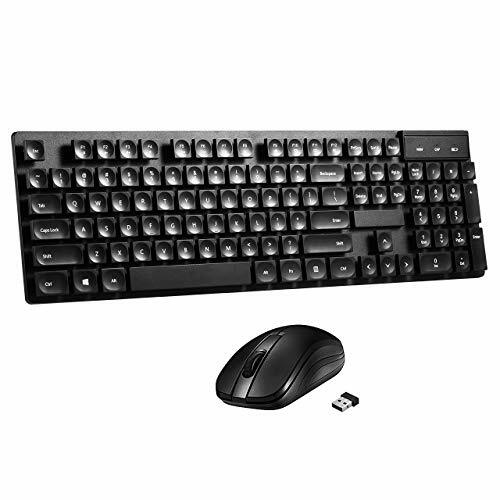 This wireless combo boasts extend battery life - Over 12 Months (Keyboard) and Up to 18 Months (Mouse). Switch ON/OFF button is included. And if no operation within 8 minutes, it will automatically enter into sleeping mode to save energy. Then press any key to wake it up. The indicator light tells when it's almost time to change the battery so that you're never out of power.